Have you ever been in a situation where you would like to get to know someone better but you don’t know how to initiate a conversation? Have you ever been trapped in a lift with someone and just wanted to break the silence by saying something, anything? Well ABA friends, in such situations you need to use small talk. 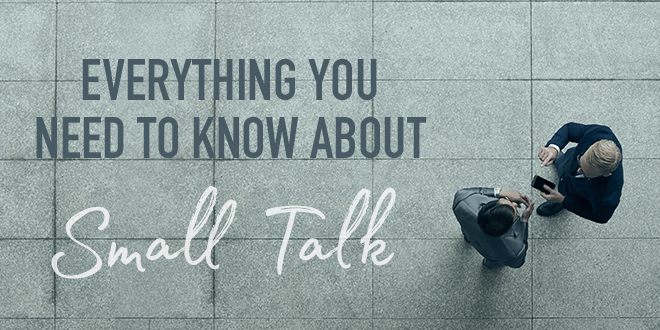 Small talk is polite conversation about unimportant or uncontroversial matters, especially during social occasions or awkward situations, or when you simply feel like a chat. Small talk is great as it can help you find out more about a person or just help start a conversation, depending on the situation. This is a great way to break the ice. Most people have something to say about the weather. It’s nice/cold/windy today, isn’t it? I wish I was somewhere warm right now. What about you? A great conversation starter when meeting someone for the first time in another country or even in your own neighbourhood is asking a person where they are from. I recognise that accent. Where is it from? Social events can be tricky as you may be alone and not really know anybody. How do you know (Mark)? It’s a great venue, isn’t it? Some people really love to have a chat about sport or current events. However, it’s wise to first analyse the situation and the person before getting into a political discussion. Don’t talk to someone about sports if you think they may not at all be interested. Do you support (Barça/Manchester United…)? I read earlier that there will be a train strike tomorrow. Did you watch the big match between (Arsenal) and (Liverpool) yesterday? I like your watch. It’s really nice. Where did you get it? How old is your son/daughter? He’s/She’s really cute! Your dog is really friendly. What’s his/her name? I like your shoes. Where did you get them? Remember that having a light-hearted chat can be a great way to get to know someone and even practise your English. Just keep it light and friendly and you will be fine! If you would love to improve your English and learn about other great topics, you can join millions of other students already doing so by signing up for free to ABA today. Thank you for getting in contact with us to sort this out. We are very sorry that you have had problems with the app. Please get in contact with support@abaenglish.com who will help you with this problem. Thank You very much, it can help us for practice our English every day, not keep silent. Next week I start teaching English. Hopefully, you can be my resources. years) is often to understand, not to speak neither to write. Sorry, I don’t understand anything about “moderation”… I didn’t criticize your work! It is a good article about small talk. it will help to speak freely from now…. After work, she sometimes goes to a bar. Après le travail, il va parfois au bar. It was a good idea to start a conversation. Thanks a lot. I`m Colombian. Greetings for all members of this group.